The point of this Friday post is not to list one bad event after another, but if I were simply to write about what happened this week, that’s unfortunately what it would look like. Even though a few good things happened this week too. Instead, here is the beginning of a theory I’m working on. This theory is a work in progress, so please comment or refute. It might be enough to write a whole thesis on, but I’m trying to present it as concisely as possible. There’s something different about what happened from Charlie Hebdo, and I think everybody would feel that. There was a sort of particularized focus and perhaps even a legitimacy in terms of – not a legitimacy, but a rationale that you could attach yourself to somehow and say, okay, they’re really angry because of this and that. This Friday was absolutely indiscriminate. It wasn’t to aggrieve one particular sense of wrong. It was to terrorize people. It was to attack everything that we do stand for. I’m not trying to suggest government policy here, but rather ask a question about how people might see and understand the world. Fiction, in all its forms – TV, movies, books, games, etc. – affects our daily lives. Even the news we read is a “story” and has to be presented with a beginning, middle, and satisfying end. As Kerry’s quote suggests, there is something we can understand about a focused attack on specific targets. Human beings often cheer for the underdog. It’s the typical David vs. Goliath story. We all cheer for David because if he wins then there is hope for all of us ordinary little guys. We too can overcome incredible odds and win against a seemingly invincible foe. 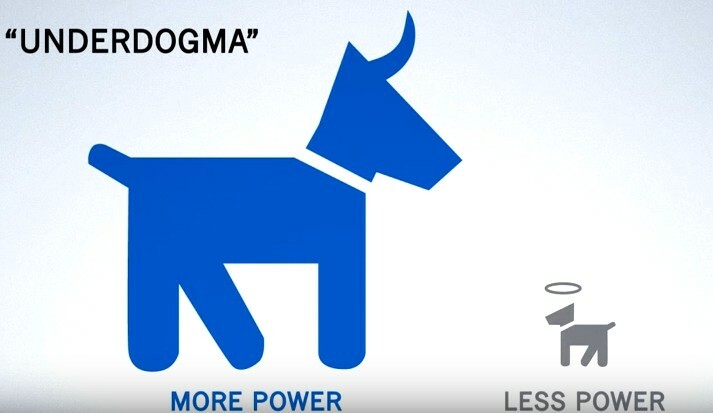 There is a theory called “underdogma” that suggests that people who believe in underdogma see anyone with less power as righteous and anyone with more power as wrong. Thus the hero of any story is the one who overcomes incredible odds to defeat an overlord who is clearly corrupted by his or her absolute power. And we cheer. Some of the most popular TV and movie fiction brings us into the world of a somehow likable villain. An early example is Tony Soprano. He’s a mobster, a killer, a ruthless businessman, and he cheats on his wife. But he loves his kids, he has anxiety issues, and he’s willing to face some of these things in therapy. How about Dr. Gregory House? He is a drug-addled misanthrope who likes to solve puzzles and hates people, but his actions find answers to medical mysteries and at the very, very end, he was a good friend to the only person who stood by him. Dexter Morgan channeled his need to kill to vigilante executions of criminals who evade criminal justice. He’s doing the world a service, right? The list could go on and on. I’m sure you probably have your own favorite anti-hero. He or she does bad things for the “right” reasons and in the dark corners of our minds, we can relate to this anti-hero and admire the total disregard of standard behavior. The anti-hero is also an underdog. Of course, in real life, we wouldn’t want to be friends with any of these anti-heroes. We wouldn’t admire them nor could we relate to them in any way. Our fictional worlds are filled with stories of the weak winning against the strong and likable villains. So when we see people who are giving everything they have to a single cause, willing to put their lives on the line for their version of justice, sending a message to a hegemonic power, we want to relate to them in some way. And when the reporters write the story, they can bend the narrative. No one wants to relate to a terrorist, but we are all freedom fighters. Real life is complicated and messy. Events don’t have clear-cut beginnings, middles, or satisfying ends. People are not clearly defined, relatable characters. Leaving the vocabulary aside, in real life, if one human being shoots or stabs another human being, there is nothing to understand and there is no rationale. If you try to rationalize the violence or relate to the perpetrator, then I suggest stepping out of the fictional world. In my opinion, a universal human value should be to choose life. If the underdog anti-hero says that he or she loves death, don’t try to understand it or rationalize it, believe it. This is not going to change in 40 minutes or 6 seasons and there won’t be a story arc showing character development and growth. We are all human beings and it would be nice to relate to each other on that level. But we don’t. Some choose life. Some choose death. At some point, changing the channel won’t be an option. ← A little this. A little that.